Async Professional is a comprehensive communications toolkit for Embarcadero Delphi®, C++Builder®, and ActiveX environments. It provides direct access to serial ports, TAPI, and the Microsoft Speech API. It supports faxing, terminal emulation, VOIP, and more. 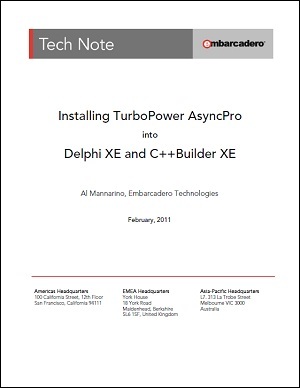 Al Mannarino will guide you through installing the following versions into Delphi XE and C++Builder XE. I had installed AsyncPro in XE5 but not tested in coding. Is it possible install in C++ Builder XE5? Thanks for that post! I would have never gotten it installed without it! Is it possible install in C++ Builder XE3?